DO YOU NEED A CLEAR IMAGE WITH NO COST OF FILM ??? CTP (Computer To Plate) no film imaging technology is a direct inkjet imaging on the plate, the latest technology. This image inkjet directly on plate can omit the film, and because of direct imaging, film and plate are “Zero” distance in between, so that the image is very sharp and can save the vacuum suction process (especially the screen frames) and the plate handling trouble and damage (especially when the large plate). Required material is only Inkjet ink, do not have to use film, can reduce lot of cost also eliminates the need for a lot of steps, operators can also be more rapid operation to reduce operating time. The principle is to move the printer on a flatbed, any plate just put on the bed then can print the image, the time of printing is the same as on the film. The flatbed can equip with UV lamp for direct plate exposure. Not only IR (infrared) lamp can put on the head section of printer to dry up the ink, but also add LED / UV to do exposure right after image print. This second option is current a hot item for corrugated printing plate and screen plate making industries. Their future is not afraid of the disappearance of photosensitive film. Hilson Huang – CEO / Flexo Technology Inc.
Future development of flexo prepress post 2016 DRUPA can be sniffed out new direction after the show, conventional flexo plate making both in technical and equipment sides have been considered to combining software and hardware together to receipt new era of digital technology, DRUPA 16 has clearly stated the trend of flexo prepress especially for the corrugated printing industry. Remembered a few years ago, the using of inkjet printer for printing industry is still in the stage of being suspected , whether CTF inkjet film can completely replace photographic film concerns four years ago, or even two years ago. Inkjet negative film can it be compatible with photosensitive film? Inkjet film can it be completely replace the photographic film industry and accepted by the industry? These questions now jump from the CTF directly for flexo CTP application. Offset CTP digital technology is the use of image can be processed and controlled by infrared (IR laser) or ultraviolet light (VIOLET laser). 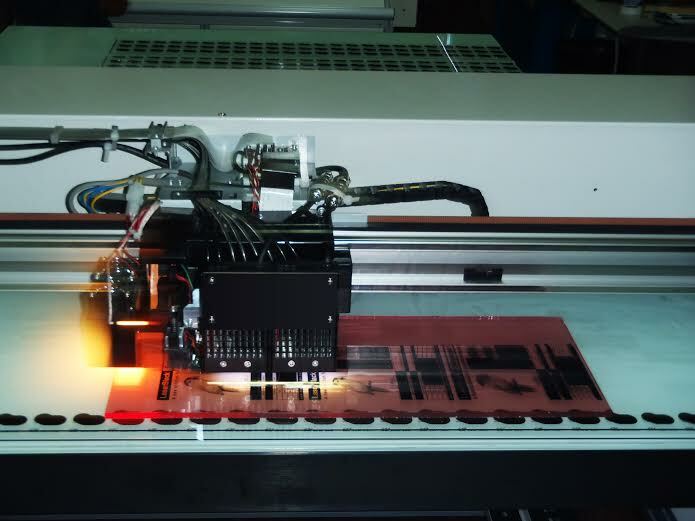 Flexographic CTP laser device is already using almost the same principle, the use of laser beams to ablate the image on a black layer coated photopolymer plate surface, then following with hardening and washout of all platemaking process steps. For such surface black coated plates user must pay a higher cost of 20% -30% to the conventional plate. During these well-developed lithographic CTP 20 years, another new inkjet imaging technology was invented in the United States and carried forward by the JP manufacturers ,as well as with early application for advertising industry of molding cutters, nowadays inkjet printer can print beautiful color jobs, then from small to large size, from slow to fast production, from roll to flatbed, plus automatic demands of feeding and delivery devices, the largest and fastest inkjet printing machine has suddenly become a digital printing press. Due to tremendous improvements of inkjet printer and software within these 10 years, users like the inkjet printer very much, bigger and sophisticated equipment with more humane operation considerations, reduce the probability of failure and down time, more use making more user’s confidence. On the other hand because of more usage of inkjet printer more common senses such as training / maintenance / repairing are also becoming popular, users accepted both equipment and technology enhancing each other, the more inkjet printer contributed to the development of today's hot use. Inkjet CTP is different from digital laser imaging machine, although they are still unable to inkjet imaging for fine dot such as 150 / 175 LPI reproduction as laser machine, but for under 100 LPI jobs inkjet imaging directly to the surface of a flexo plate with color separations and screening by RIP software is more than sufficient for corrugated box printing. Please understand, the greatest demand of photopolymer plate is not for flexible package / label / paper bag printing, but for corrugated box printing. This largest piece of cake is 60-70 % share of the global market, direct image flexo CTP inkjet printer is to be used perfectly on plate making for corrugated printing, with this no film / no vacuum direct imaging technology it is easy to make 100% successful jobs, leaving only washout and follow-up procedure to finish the plate, thus solve a large part of failure possibility or to make again due to manual negligence. In DRUPA 2016, the direct imaging digital flexo machine is not the main topic now, the prepress battlefield has been extended to direct imaging with inline back + main exposures that has become total solution of flexo prepress digitization. ESKO has announced new CRYSTAL unit with double-side exposures which can be used in connection with their CDI direct image system, this can significantly reduce losses by turning over the plate for back exposure and then turning back for film exposure especially when it is a large size plate. Unlike the separated type CRYSTAL exposure unit, the inkjet printer is easy to install UV lamps which can be mounted under the flatbed and the LED / UV exposure light source can be directly installed behind the head of imaging can be carried out main exposure (image exposure) without vacuum suction, which complies with the latest flexographic platemaking total solutions can reduce processing time 68%, reducing operator training time by 50% and speed up plate making time of 74% if according to the CRYSTAL unit. for revolutionary plate making automation. Photopolymer flexo printing plate is playing an integral role in corrugated box printing industry, most of printing plates are made either by liquid resin or solid plate. These plates are with properties of low durometer, resilience and durability for good corrugated printing result, but due to big in size and thicker in plate therefore the weight is heavy. To face the new era of high-speed printing presses, the traditional thick plate becomes a problem, in the high-speed printing with heavy plate due to dynamic imbalance it will cause vibration and effect printing results. The only way to improve is to reduce the weight of the entire plate, which is why “I-plate” is required. In addition, the plate is also known as island plate, that is, all the printing images are on the island above, and the relieve areas are reduced to the base film for weight reduction. The result of this weight reduction is to remove the unnecessary plate material until the base film, the whole plate can be easy to mount on the plate cylinder directly. This is also good for storage and transportation of the plate. Originally, this plate-making method is only suitable for the production of liquid resin plate, because the liquid resin can be recycled, so only to reduce costs for consideration, but nowadays new technology of CTP (Computer To Plate) printer to make direct image possible in-position on both sides of plate in good registration upon the flatbed of printer, to make a solid I- plate now is simple, easy and convenient. 1. To print mask-film on the back side of the plate at the same time can do led / UV exposure. 2. Turn over the plate for main image print with led / UV exposure as usual. 3. Both of mask image and negative image positioning are accurate only according to the plate position on flatbed and it is very convenient to print image with exposure both sides. @flexo RD team was thinking more than that: a new technology can print on any untreated film as long as it is a transparent substrate in order to substitute photo film. In addition, to be able to print image on photopolymer plate directly with no film / no vacuum for 100% successful jobs and labor / cost saving. Due to can print on any untreated film, therefore it is also can print on any surface of the photopolymer plate as well as on the screen frame, therefore the CTP inkjet printer was born in 2014, which is 8 years after the birth of LaserBlack. d. No turn-over for back exposure. f. Good for high speed production of platemaking up to 30m2 each working day. Ink consumption of our CTP is 13-20 ml per m2 printing depends on the black area of image to print. Print speed is 1 – 3.5 m2 per hour i.e. 17 - 60 min. per m2 depends on the RIP settings. Ink and cleaner are packed in a ink pack of 200ml are available from us and our dealer, which can print 10-17 m2 of black image, if for your job of 40 m2 each day, suggest to use 2 packs every day. For mass production of 30 m2 / each day we have a high speed high performance 2nd generation 3matic printer for you with only a very little additive cost. 13-20 ml per m2 black print depends on image area and settings of dpi / pass / dot size …. Price are USD 50.- / pack of ink USD 15.- / pack of cleaner. October 5th 2015 it is a celebrative date of NozzleBlack for their new development of inkjet CTP direct image system + UV double side exposure on the printer flat-bed (An inline CTP inkjet printer with main exposure + back exposure (3 in 1) which is one step ahead than Esco CDI Cantilever with main UV exposure only). This is a small step in laboratory of Team @flexo but it is a great step for flexographic printing industry. In May 2012 during Drupa, a new technology of digital inkjet printing press was shown and have been commended as an great innovation after Mr. Johannes Gutenberg had invented a printing press. As a matter of fact it was derived from electronic image forming by a liquid electro-ink method in 1993 during IPEX, by taking advantages of magnetic field reaction to form an image roller then transfer onto paper or substrate. After 20 years, direct image to photopolymer plate by inkjet printer – CTP INKJET for flexo plate making without using film is also becoming practical and practical. as tracing paper which is a cheapest translucent paper material for negative making as a film. Ton May 14-17 2013, CTP INKJET for photopolymer plate making was announced in China Print by which opening a new era of Flexo CTP. Conventional photographic film manufacturers have announced to terminate the production, this has scared most of the users, film price increase day by day thus has forced consumers to pursue other methods in stead. Due to Nano technology, to prepare a color dye of 20 nano is no longer difficult now, plus additives for the ink, it is easy to have a ink layer by inkjet at 40-50 nano and reaching the same density of offset ink layer which is 400-500 nano, however the consumption of ink is only 10% does not matter it is an ink layer of color reflection or black opaque to block the light transmission when forming the plate image. This is the reason why we can use the ink to spray image directly on the photopolymer plates, no mater it’s a letterpress plate or flexographic plate in any thickness with any brands. Nano-ink can absorb more lights and reflecting more than regular an inks so that the reproduction dot is showing sharper, slippery, even and shining in order to reflect more colorful areas of YMCK with 15% more color than offset printing ink layers. This is the specialty of nano-ink which is reducing ink absorbed by substrate to shine up colorfully. Moreover, with thinner layer of nano-ink inkjet printers can spray at higher speed, no mater it is a coated or uncoated surface, film or paper with no coagulation or spreading or even on any photopolymer material which is available on the market. NozzleBlack CTP inkjet is using a spray head with 2 sets for YMCK each for color printing in total of 8 nozzles. For negative image spray we use only K ink in black color, Depends on the ink, once the opaque is no good enough then we suggest to use 2 nozzles to spray K ink at the same time, thus will assure the black optical density over 3.50 which is excellent enough during plate making in order to black out the UVA lights and keep image sharp despite of it is a rough image or fine image. The other 6 nozzles can be spared for future use. with nano dye and additives can allow ink drying quickly on non-treated substrates, the cost is cheaper than UV based ink and no UV curing device is required so as to a very expensive laser image ablator, which is saving a lot from hard wares. Comparing with offset printing ink layer the CTP inkjet ink layer is only 10% in thickness which means that can save a lot of ink not only in quantity but also in cost and cost of transportation. No UV curing or extra drying unit is necessary when using nano ink, therefore saving energy a lot, after inkjet only a small bulb after the nozzle will drying the ink quick this will also reduce the problem of nozzle blocking. Use no more photographic film therefore the film cost is reduced, Due to use of nono ink a A2 sized plate will use only 4 cc of black ink able to achieve optical density over 3.50. 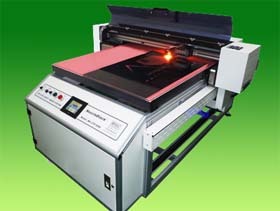 Do not have to use any Digital plate which is about 30-40% cost up than a conventional photopolymer plate. Wide range of substrates can be used and no special treating or coating is required therefore, can inkjet on any letterpress plate, flexographic plate, water wash flexo plate as well as for liquid photopolymer plate making. RD team finds that direct image on film for liquid resin spreading can be also sprayed in order for resin contact directly to the image with 0-distance. This has solved no-sharp-reproduction problem from the beginning of liquid photopolymer plate making had been created and invented. fine reproduction, easy access, less breakdown as well as reasonable hard ware cost so that it can be accepted by the industry easily no mater how big is the size required. This is quit different from a kind of small size A2 machine in the market now only good for thickness less than 2.30mm from which the market is divided. In summarizing, a new era of CTP inkjet for flexo plate making is opening right after the China Print show in 2013, as Jessica Harkins reported on the Flexo magazine there is a wide array of people will make up the flexographic industry. Business owners, design partners, creative brains, old-school fundamentalists, young techs and everyone in between will work together to make our specialized industry stronger. NozzleBlack is expecting here the flower blossom. Thanks to the new nano technology, ink opaque density over 4.50 now can print image directly on photopolymer plate and screen frame which means that no more vacuum process during plate making, thus will make film and plate contacted completely with zero-distance and no more air bubble problem which is a major failure of plate making. In addition to 100% successful job, high density reaching 4.50 can achieve a good exposure result easily even for very small dot for flexo or a fine detail on screen frame for electronic industry requirement. Thanks to the new nano technology, ink opaque density over 4.50 now can print image directly on photopolymer plate and screen frame which means that no more vacuum process during plate making thus will make film and plate contacted completely with zero distance and no more air bubble problem which is a major failure of plate making . In addition to 100% successful job ,high density reaching 4.50 can achieve a good exposure result easily even for very small dot for flexo or a fine detail on screen frame for electronic industry requirement opening a new era. Good for all kind of solvent and water wash photopolymer plate and screen frames.